Foreign Direct Investment (FDI) flows are an important dimension of U.S.-China economic relations. Rhodium Group and the National Committee on U.S.-China Relations jointly released the 2018 update to our “Two-Way Street” report, which reviews bilateral FDI trends, breaks down bilateral flows sector by sector, and discusses the outlook. Together, the report and interactive US-China FDI Project website provide a clear accounting of FDI flows between the U.S. and China from 1990 to the present, offering policy and business leaders the data needed to better manage this important element of the bilateral relationship. In 2017, US-China FDI flows declined by one third (28%), falling to $43 billion from the $60 billion we recorded for 2016. American investment into China was almost unchanged over the previous year, at $14 billion compared to $13.8 billion in 2016. Flows remained unbalanced with Chinese FDI in the US at twice the level of US investment in China ($29 billion vs. $14 billion). In terms of stock, US companies still have significantly more historical investment in China than their Chinese counterparts have in the US. Policy and politics in both countries — rather than commercial forces — are largely to blame for the decline. Chinese investment in the US was curtailed by Beijing tightening controls over outbound investment and a crackdown on leveraged private investors, which caused China’s global outbound FDI (OFDI) to decline for the first time in more than a decade. Chinese acquisitions in the United States were also pruned by increased investment screening by the Committee on Foreign Investment in the United States (CFIUS), a result of both changing threat assessments and a longer than usual leadership vacuum during the transition to a new administration. Policy interventions impacted the industry composition of investment, in both directions. The big losers from China’s new outbound investment rules were entertainment, real estate and hospitality, and consumer products and services. 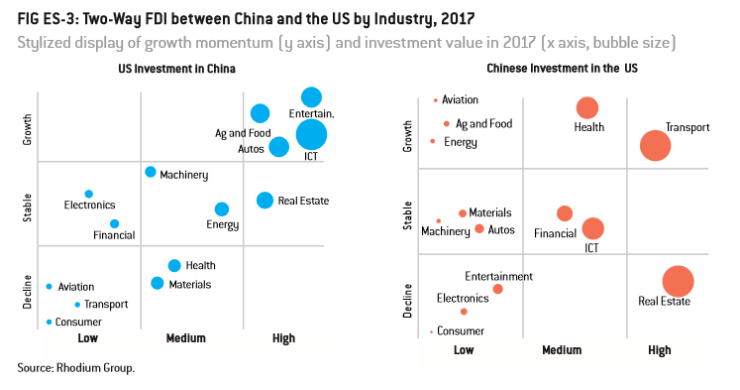 Investment remained stable or grew in many high-tech sectors (health and biotech, ICT) and industries related to China’s global infrastructure push (transport and infrastructure). While endorsed by Beijing, Chinese acquisitions in high-tech sectors were increasingly scrutinized by CFIUS, especially in areas seen as relevant to current defense capabilities (semiconductors) or future defense applications (“emerging critical technologies”). The safety and integrity of personal data of US citizens has also taken a greater role in CFIUS assessments of Chinese acquisitions. Looking forward, two-way investment flows could still grow, but current concerns need to be managed properly on both sides. For more background on the project and an interactive web application to explore the latest data, please visit the website of the US-China FDI Project.